The heart of downtown Silver Spring, Maryland is filled with interesting and not-so-interesting places to eat. One of the more enticing come-in-off-the-street joints is Eggspectations, a nouveau take on the Breakfast-all-day theme. In fact, they have a full dinner menu complete with salads, chops, steaks, burgers, sandwiches, and pastas. Many utilize eggs in traditional cooking techniques as well as for garnish, and many are simply nice-looking entrees. Following this 2-page “regular part” of the menu there starts the breakfast section. This is even lengthier and, well, eggier. There are eggs, crepes, waffles and pancakes in seemingly every combination and style, with cheese or potatoes or potato latkes (the “oy vegg”) or corn beef hash or bacon or steak or chicken (what came first, the chicken or the…?) or jumbo lump crab meat or Hollandaise. The menu, as you can guess, was seemingly endless, with its clever jingle and cheesy linguistic as well as culinary plays on the “egg.” This made deciding on dinner darned difficult, especially amidst a somewhat pushy waitress who decided she needed to rattle off every available beverage (alcoholic and non) when we weren't ready to order the first time. “Do you really have milk? Thanks for telling me that.” As if we needed more confusion amidst this crazy menu. We decided. Finally. I tried a hybrid between eggy and entree, and since I had been severely in the mood for a burger, found a burger with egg ON it. This was called the Parisienne burger and consisted of a juicy, all-beef patty cooked to a perfect medium rare. It was one of the moister and most flavorful burgers I've had in a while – almost the slightest bit spicy even!. Atop the burger was a melted layer of the delicious, nutty, and aromatic gruyere cheese (one of my favorites), tomato, red onion, lettuce and a perfectly cooked, sliced-up hard-boiled egg. Sounds weird? It was actually awesome! The flavors simply sparkled and exploded. I was a little tepid going in, but it was actually a totally tasty burger. The egg really added something unique to the taste, and it was cooked just right: the white was soft, warm and delicate and the yolk was just-hard and filled with flavor. 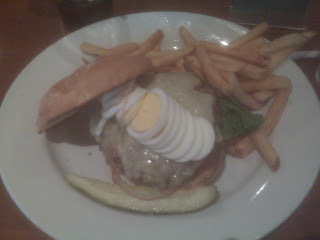 The egg helped the texture and flavor of the burger, onion and gruyere to meld together and sing. So was I surprised to have an awesome burger at an egg place? Well, maybe a little, but in a good way. The others ordered eggier dishes like a Benedict with salad, and poached eggs with (“too-greasy”) corn beef hash. Neither was quite as singing as I was, but both thought the eggs were excellent, or should I say eggcellent. Overall, I definitely liked what I ate but continued to feel that the menu at Eggspectations was so deep and complicated that I couldn't guarantee that I'd find something quite as palette-pleasing the next time. It's very hard to focus there, and that is still my main complaint. So my eggspectation for next time is promising but not entirely confident, as I could have just gotten lucky this time. But maybe their quantity deep menu is equally deep in quality. If so, I'll discover that after another visit or two to Silver Spring, and my eggspectant eggspectation for Eggspectations will be officially eggcellent.